Known by locals, the Molalla River Corridor and Recreation Area has undergone a recent transformation, mostly in part due to numerous projects by the Bureau of Land Management (BLM). New campsites, multi-use trails, day-use areas and swimming holes make this a great area for families, groups and individuals looking to get off the beaten path and be surrounded by crystal clear rivers, old-growth trees and less populated trails. 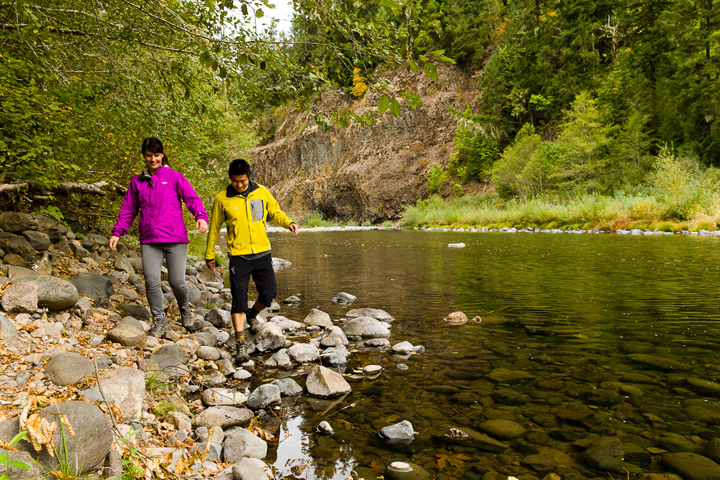 The Molalla River Corridor is open to hikers year-round but is closed to equestrians and mountain bikers from October 15 through April 15. Parking at the Hardy Creek Trailhead, take the main trail just left of the information kiosk uphill towards Huckleberry Trail. After a brief uphill, take a right at the second kiosk towards Rim Trail. At around 50 yards, you will take a left at the fork to start the Rim Trail. Continue hiking uphill through the old-growth forest containing Douglas Fir, Alder, Cedar and Cottonwood as well as sword ferns that carpet the forest floor. Stay right at the Fern Creek to Deer Skull/Rim Trail junction to continue upwards on the Rim Trail. At the Bear Woods loop trail, veer right to stay on the Rim Trail until its end at Bobcat Road. Take a left and head downhill on Bobcat Road towards Huckleberry Trail. Continue on the old forest road named the Huckleberry Trail, passing Annie’s Cabin (an old homestead named after its last tenant) staying left at any forks until you find yourself back at the second informative kiosk at the beginning of the hike. Take a right to head downhill back to the Hardy Creek Trailhead parking lot. From the second kiosk, pass by the Rim Trail on your left and continue on to Looney’s Trail. You’ll find a beautiful photo opportunity at the Hardy Creek Bridge. At Clifford’s Crossing Trail stay left to continue on Looney’s Trail, which will turn into Amanda’s Trail. Left at the next junction, head uphill towards Leapfrog Loop and take a left at the Leapfrog Loop (0.75 miles) Trailhead. Take Leapfrog Loop to the top of the ridge, staying right at the top, all the way around back to Amanda’s Trail. Turn right on Amanda’s Trail, which will turn back into Looney’s Trail. Follow it back to the second kiosk, then head left to return to the Hardy Creek Trailhead parking lot.